This 2-story wood-framed Federal period house has received additions and been remodeled such that the eclectic Queen Anne category best reflects its amended style. The house began with a 5-bay, center entrance facade under a gable roof with slate shingles. Its second story slightly overhangs the first floor. Two brick endwall chimneys, one on each gable end, define the width of the original house. Two front gable dormers with 6-o-6 windows flank a front gabled wall dormer with fanlight attic window—these were likely early additions. The house is clad with wood clapboard and has corner boards. A number of the evident changes probably occurred during the period when the Queen Anne style became popular in the 1880s. Colonial Revival style details were often incorporated into Queen Anne compositions, the nation’s Centennial in 1876 having heightened interest in all things colonial. 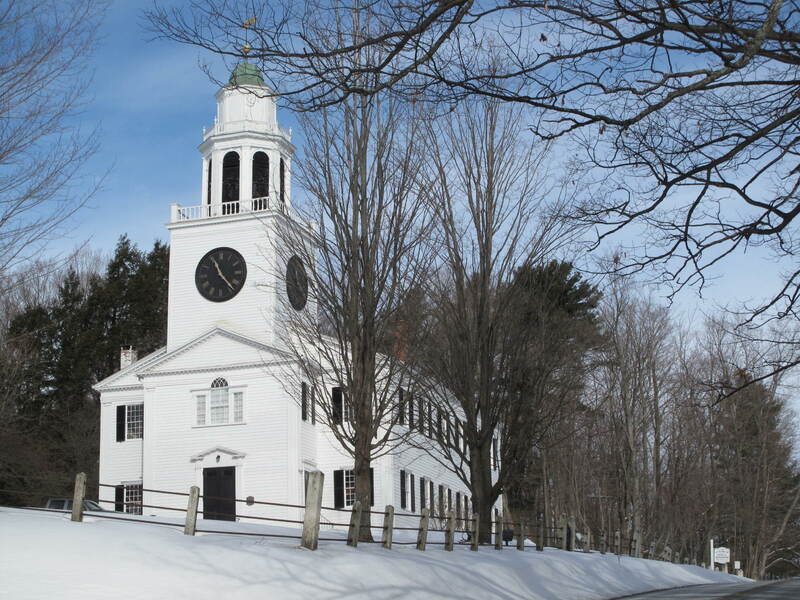 These modifications would have included the Palladian window centered above the front entrance with its fluted pilasters, dentils, and tracery in the arch of the middle section. (The door surround with its 2/3rds-length, 3-pane sidelights flanked by fluted pilasters may be original however.) The entrance porch was certainly another addition. It has a pedimented gable roof, supported by four fluted Doric columns, and having modillions, a classical entablature with triglyphs, metopes, and guttae, along with a barrel-vaulted ceiling. 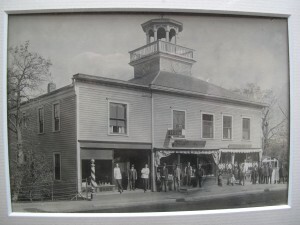 It was probably constructed concurrently with the 2-story extension to the right side, which has a 2-story canted bay window on its front facade and a hipped roof. There is a large 2-story hipped-roof rear ell that has a 2-story hipped-roofed extension off its rear (having a triangular gabled dormer), a 2-story hipped roof ell of its left side, and a small lean-to behind it, also on its left. On its right side is an entrance porch with hipped roof and two Doric columns. 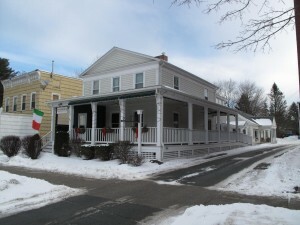 A flat-roofed veranda off the left side of the original house (which appears to have been recently added or rebuilt) has triple Doric columns at its outer corners and a single one at the center. The windows are generally 6-o-6 on the first floor and 9-o-6 on the second floor; they have authentic wood window blinds. The foundation is of stone. Mature deciduous and coniferous trees surround the house. Plumstead was the first site of the jail and the jailer’s house- part of the structures were burned down by a prisoner in 1814. Plumstead was first the summer home of Mr. Alfred Deveaus, who sold it to Mrs. Joseph Whistler. In 1940 the property was acquired by Mrs. Bruce W. Sanborn then descended to her son Carl Weyerhauser. In 1968, it was sold to a local lawyer, Mr. Charles Alberti (who is now retired Superior Justice Alberti). 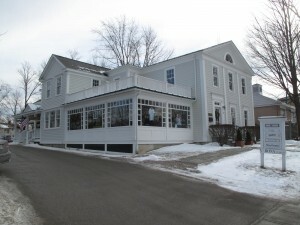 In 1978, the property was purchased by Mr. and Mrs. Frank Macioge. The Macioge’s sold the property in 1985 to Paul and Mirjana Draskovic, who are the current owners. Wood, David: Lenox: Massachusetts Shire Town, p.198. This was originally a Federal-style house that has been altered over the years. The paired brackets under the eaves, round-arched window in the front gable, and round-arched door hood are all features of the Italianate style, indicating that a major remodeling took place during the period of that styles popularity (c.1850 – 1880). 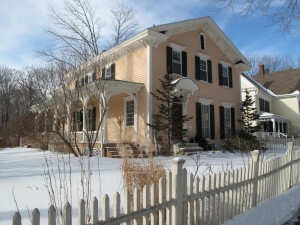 There are relatively few Italianate houses in Lenox, making this earlier house an interesting example of a later style. 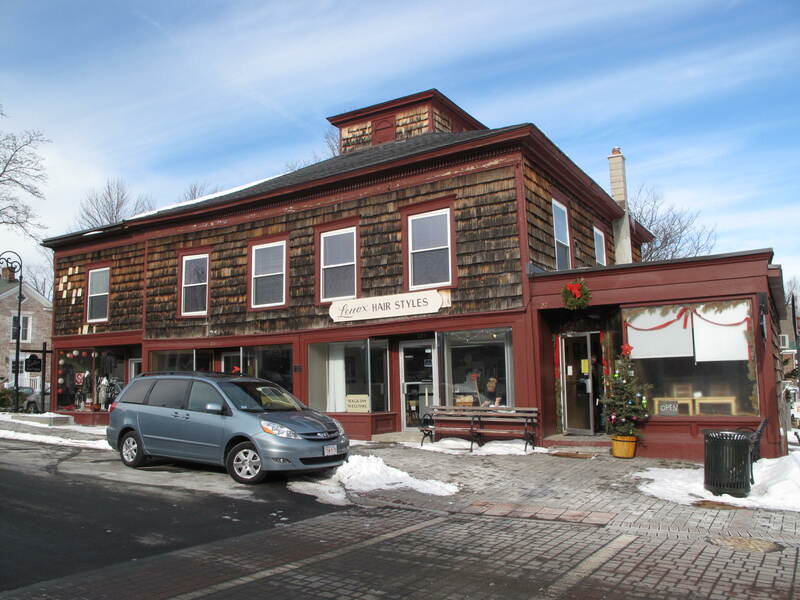 This Italianate style building has two stories and an asphalt shingle roof which is intact. It consists of 3-bays, with a front gable roof with double scroll sawn modillions on the eaves. The two brick center chimneys are corbelled to create flared tops. It is sided with wood clapboards and the arched entrance canopy contains scroll sawn console brackets. The door surround has an arched transom and the window headers have cornices. The windows on the upper floors are 6-o-6. There are authentic window blinds, an arched attic window and a stone foundation. There is a wood picket fence around property. 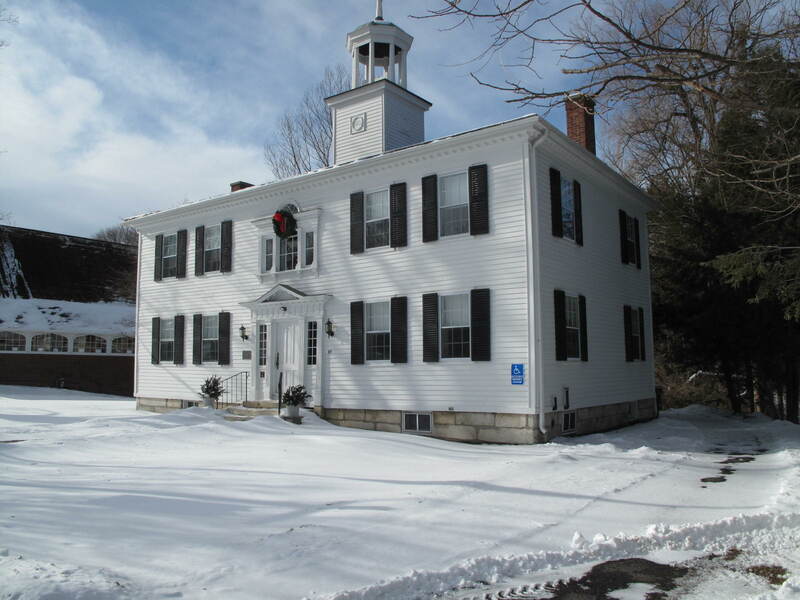 This house was built in 1815 for Dr. Worthington, who may have practiced medicine here. It remained in the Worthington family until 1919, when the property was willed to the Church on the Hill by Mrs. Mary H. Barrett. Mrs. Barrett was a grand-daughter of the original owner, who had been a deacon of the church. From 1925 to 1975 the house was used as a parsonage and a gathering place for social events. In 1975 it was returned to use as a private home. Robert M. and Cynthia A. Taylor were the owners in 1979. The property was acquired by Arthur A. Autorino in1989 and then by Thomas B. Sherman in 1997 and then by Steven M. Fortuna in 2001. This Federal style building has two stories, an asphalt shingle roof and is intact. It is a 5-bay building with a central entrance. The wood framed structure has a 2-story cross-gabled rear ell. One end chimney and one interior chimney suggests that a 2-story addition to the right of the original 3-bay house has been added. It has wood clapboard siding and paneled window headers with cornices on the first floor windows. The exterior has corner boards, an entrance pavilion with fluted Doric columns and pilasters, triglyphs and metopes on the frieze. The front door surround has a plaid paned transom and 1/2-length sidelights. The house has 6-o-6 windows and a stone foundation. There is a wood picket fence with scalloped design between the posts. 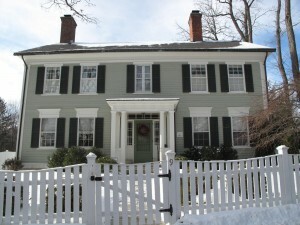 This is one of the few Federal houses to survive in Lenox Village; although there is evidence that many more were built, most were demolished in the second half of the nineteenth century. 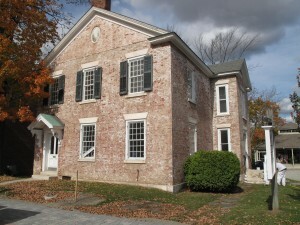 Calvin Burnham built this house around 1805, and lived here with his family. Burnham was probably a brother of Julia Ann Burnham, who came from Vermont to marry Col. Charles Mattoon of Lenox. Calvin Burnham had numerous business dealings with Mattoon, reflected in various deeds. Burnham’s daughter Anna also has some unusual business dealings; a deed of 1814 granted her the lease to her room in her father’s house in return for payment of one peppercorn. 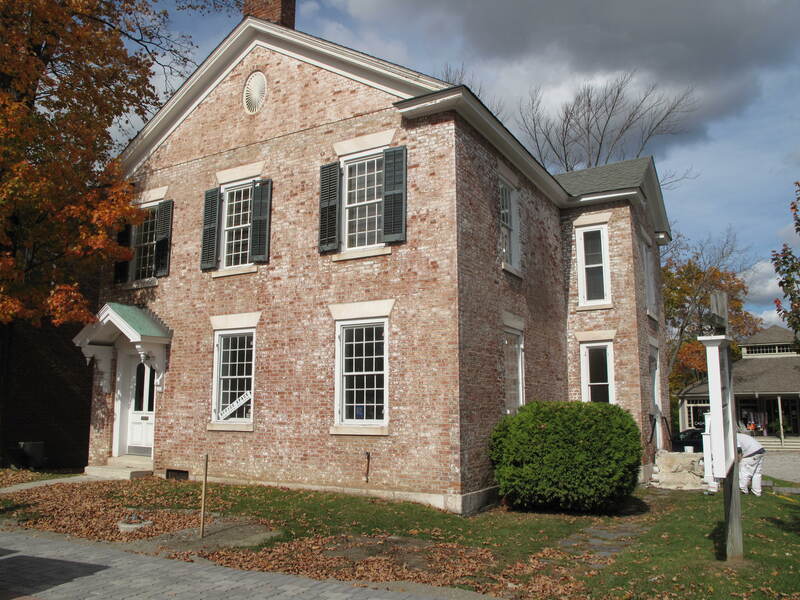 On her father’s death she inherited the house, and in 1822 sold it to the American Board of Commissioners for Foreign Missions, for payment of $500 “and also in consideration of the love and regard which I have for the missionary cause.” John Hotchkin purchased the house from the A.B.C.F.M. 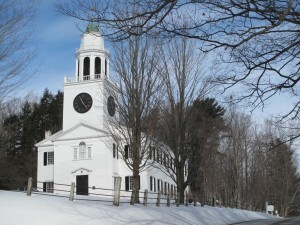 in 1825, two years after he returned to Lenox from the Andover Theological Seminary to follow Levi Glezen as principal of the Lenox Academy. Hotchkin, a graduate of the Academy, held that position until 1848, but continued to teach until his death in 1862. His descendents sold the house to Anna B. Shaw after 1876, and the Shaw family used it as a summer home. It was known as “Homestead” during this period (not to be confused with “The Homestead” at Cliffwood and Greenwood Streets). Later it was renamed “Roadside”, and the name was changed again to “Strawberry House” by a subsequent owner, Anna R. Alexandre. The property was acquired by Horizon Nominee Trust in1998 and then by Andrew Collins Vickery in 2003 and then by Eric George Haythorne in 2007. This Greek Revival style building has two stories, an asphalt shingle roof and has been significantly altered. It is a three-bay wood frame. It has a front gable roof–simple pediment, and full entablature with a plain frieze. It has a brick center chimney, wood clapboard siding and paneled corner pilasters. There is a two-story rear ell with a gable roof. The foundation is stone. New research notes that on the 1854 Clark Map, the property is labeled “Mrs. Hickok”; the 1893 – 1905 Sanborn maps show building footprint without any front porch but with right-side porches; the 1911 Sanborn depicts a small front entry porch (thus earlier B form statement about the front entrance porch dating to1860s is incorrect) and labels the building “Barbers”. It was purchased in 2001 by Serge Paccaud and is currently used as a restaurant. This Federal style building has two stories, an asphalt shingle roof and has been altered. 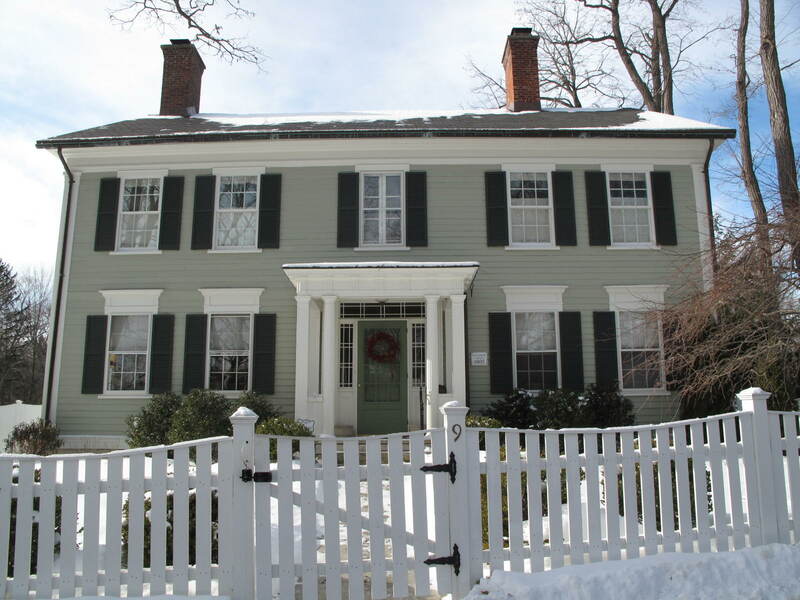 It has a three-bay center entrance and a pedimented front gable roof with attic fanlight. 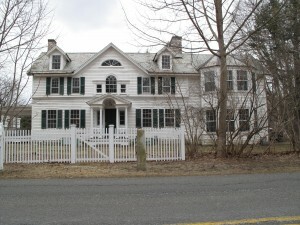 It is wood frame with wood clapboard siding; pilasters flank the center bay. The corner pilasters have light/refined entablature. The front door is surrounded by a three-light transom and pilasters. The door has a12-light window. The right side entry has a gable header with a sunburst design, dentils, and pilasters. The house has a stone foundation. Farther back on the right side is a small cross-gabled box bay with pedimented side entry; large recessed cross-gabled side ell on left with concrete foundation (added after 1939). 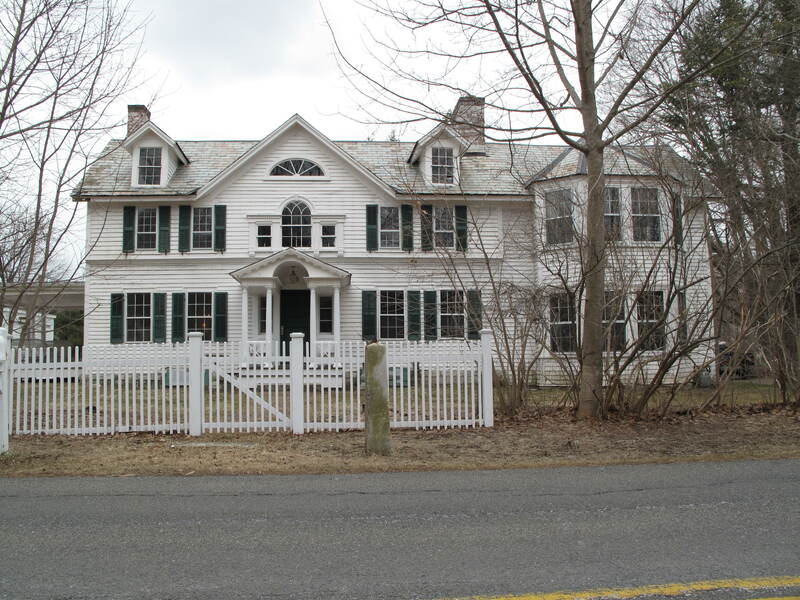 Oliver Peck, the original owner of this house, was an attorney with the Lenox firm Peck and Phelps. A subsequent owner, Benjamin Rogers, was an employee of George Westinghouse, and was in part responsible for bring electricity to the town. Rogers had his workshop in an annex, later used as a greenhouse. 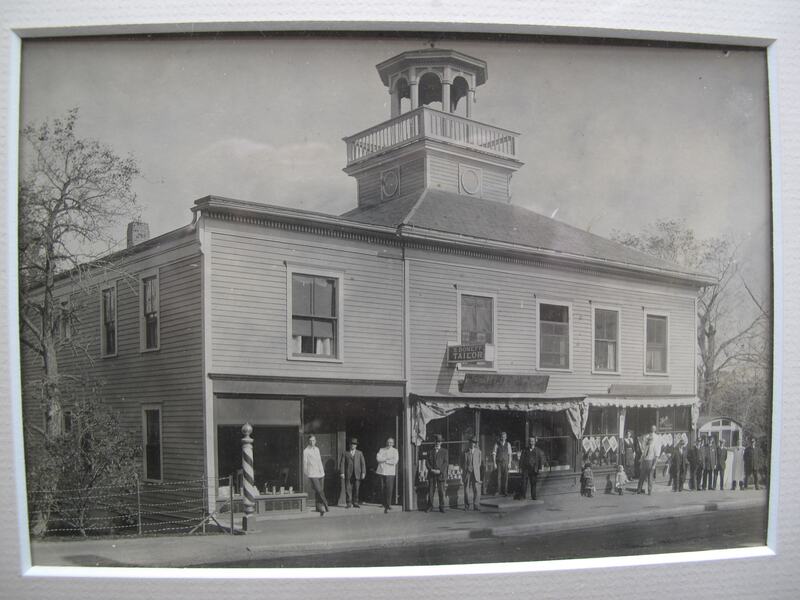 In 1876 Mrs. Platner was the owner, in 1900 it was Francis Weed and in 1904 Benjamin H. Rogers purchased the property. This house caught fire in the Easter fire of 1909, but was saved from destruction. In the 1980’s the house was owned by Dr. Carl Bergan who used space in the house as a medical office and rented out apartments. 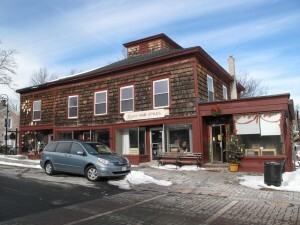 Currently the building is owned by Charles Schulz and contains a hair salon and retail stores.